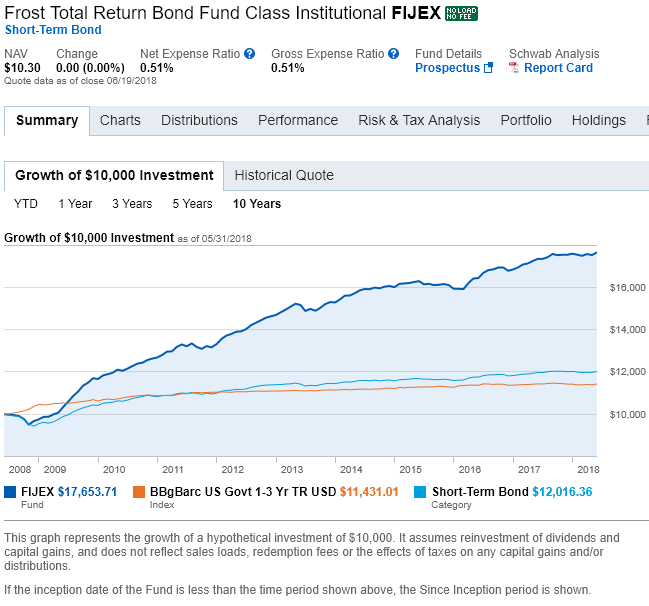 What is the difference between a bond fund and a bond index fund? 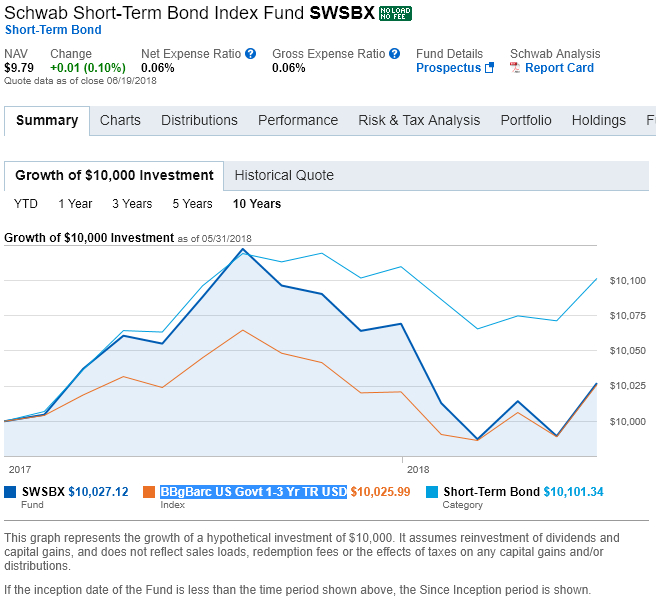 For example, FIJEX is labeled as a normal bond fund with a gross expense ratio of 0.51% and SWSBX is a bond index fund with a much lower gross expense ratio of 0.06%. Both funds have similar top 10 holdings: a variety of US treasury notes. I'm wondering if there's anything special about the bond fund over the bond index fund that would justify the higher expenses. I couldn't do a comparison of the two funds' "growth of $10,000" graphs because SWSBX has only been around for a year. If you just look at 2017 and 2018, you'll notice that SWSBX didn't have much net growth, while FIJEX did have net growth. Why is there a discrepancy if they hold a similar mixture of US treasuries? An index fund buys all bonds in some index based on their relative weights (how much the bond appears in the index or what percentage of the market the bond is). A managed fund does research and buys bonds that it expects to do better than other bonds. Doing the research costs money, so they charge higher fees. In theory the research is supposed to make the bonds they choose do better than the index as a whole. In practice, indexes often perform at least as well as managed funds after the fees are deducted. Some managed funds outperform their indexes for some period of time. It's unclear if they are superior investors or just lucky. Even if the index fund is new, you should be able to estimate its performance by looking at the reference index. In your images, the reference index for both funds is BBgBarc US govt 1-3 Yr Tr USD. As you might guess, the index fund's performance is very similar to that of the index. The managed fund's performance is showing higher. You should expect the index fund to continue to track the index closely. The past good performance of the managed fund is not evidence that it will outperform in the future, but it might. As a caveat, note that the managed fund has sometimes underperformed the index for some time periods. I can see that just looking at the ten-year performance in your image. This is normal and expected. Be careful about leaving the fund based on short term performance. You might be leaving just as the fund is about to pick up. For example, the index fund might (or might not) outperform the managed fund in the coming year. That could indicate that the managed fund knows something that the index fund does not and is due for a period of strong growth. Or it could indicate that their luck has run out. As they say, past performance does not guarantee future results. A bond fund is actively managed according to some mandate that usually involves trying to achieve superior investment results relative to a stated benchmark or index. A bond index fund will passively invest, usually in a representative sample, in the component securities of an index in order to track the investment performance of that index before-fees. A total return mandate usually involves trying to exceed the returns of a bond market aggregate index, not just the short-term segment. Bond mutual fund. Bond index mutual fund. They are both mutual funds. And "index" means the usual thing it means for mutual funds. The regular fund employs a "pinball wizard" genius savant stock picker with a huge research staff, who for some bizarre reason works for the fund instead of just working for herself. The picker, her yacht and the NYC apartments of all the research staff are paid by the expense ratio of the fund. In an index fund, the fund simply follows the index, and a part time clerk running a robotic script occasionally rebalances the portfolio to match the index. This has an expense ratio of almost nil. The idea is the stock picker can pick stocks, er, bonds better than the robot. But can she do so by more than her higher expense ratio? Usually not, says John Bogle's seminal book "Common Sense on Mutual Funds". Not the answer you're looking for? Browse other questions tagged bonds index-fund bond-funds or ask your own question.